'Been very busy man, very busy. But still I gotta blog. 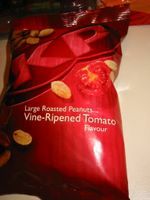 And blog I do with these new loves of my snacks. I lurve nuts of almost any kind. I haven't met a nut (the real kind) I didn't like. These new roasted peanuts from KP got me hmmmming while scoffing them down. One is tomato flavoured while the other has cracked black peppers on it. I actually liked the tomato thingie better. 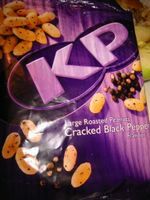 Its got this tangy-soury spice that mingles well with the nuttiness of the peanuts as you chomp on it. Have a go. Try it at your nearest supermarkets and groceries.